The Alfa Romeo 1750 Spider Veloce made the debut Brussels 1968. Production started May 1967 with 125 pre-series cars. These cars were on the market early 1968. The 1750 Veloce was the same car as the Duetto and had the same designed items. The headlamp cowls, lights and lenses, the tailpipe, bumpers etc. were the same. Some re-designed exterior parts made it possible to tell the difference. Wider tyres (165/14 instead of 155/15) - choice = Pirelli Cinturato HR/Kleber Colombes/Michelin XAS. Rear-view mirror moved from wing to door. Very early Spiders (150?) had rear-view mirror on left wing like Duetto. 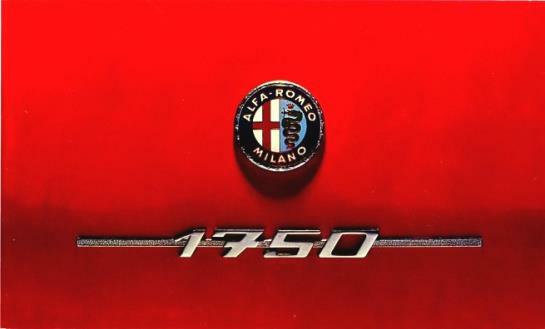 1750 badge on boot-lid and the Alfa Romeo with the snake and the serpent. This is in fact the weapon of the city of Milan. The red cross was used among the crusaders. Tear drop side indicators between front wheel and door. Later the indicators were moved forward and re-designed. Optional hardtop reverse angle r/window on later cars. Early ones had the same as the Duetto.-but was this a later option. Engine - incl different carbs + lubrication circuits. Later engines had electric fan. First series of engines had non-offset piston pins. Changed mid 1968 to offset due to engine noise from pistons. Twin brake servos (front and rear) - left of engine bay. Early cars had single brake servo by Dunlop or ATE. Warning lights repositioned to centre console by minor gauges . Only one toggle switch to left of radio cover panel. Scandinavian cars had one switch to the right of radio cover panel to operate the wind-screen flusher.